This resource is part of a collection of visualizations that illustrate observed changes in temperature, precipitation, storms, floods, and droughts. This resource focuses on US and Global temperature. Rising global average temperature is associated with widespread changes in weather patterns. Scientific studies indicate that extreme weather events such as heat waves and large storms are likely to become more frequent or more intense with human-induced climate change. The larger collection includes climate change indicators within the oceans, snow and ice, and other ecosystems and the effects on humans and our society. The website houses concise summaries on trends in temperature, precipitation, storms, floods, and droughts and are linked with associated graphs and data that can viewed online and downloaded. It would be beneficial to develop learning activities around the visualization to facilitate student learning. Good resource, but does not include structure for guided learning within a classroom setting. This resource focuses on observed changes in temperature across the US and the world. Rising global average temperature is associated with widespread changes in weather patterns. Scientific studies indicate that extreme weather events such as heat waves and large storms are likely to become more frequent or more intense with human-induced climate change. The larger collection includes climate change indicators within the oceans, snow and ice, and other ecosystems and the effects on humans and our society. 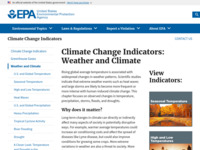 This resource from the EPA is a useful compendium that explains and illustrates the relationship between climate change and weather through observed data. This page focuses on US and Global Temperature trends. The collection of pages provides a detailed view on many different climate variables. It would be a good resource to use for examining how these variables have changed over time and how they are impacting climate and weather. The static visuals are varied and easy to read and understand. Very easy to access and view online. Website also provides PDFs of all graphs and information for downloading.